AndyG Projects: Happy Wear It Purple DAY! 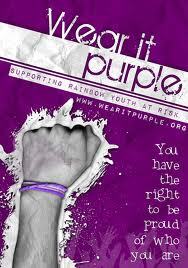 Happy Wear It Purple DAY! If you see anyone in neglect or being bullied for who they are, lend a hand and go up and say stop! It's completely irrelevant to be unsupported in any way shape or form for who we are in this day in age. September 7th! Remember the date, flash out your purple and celebrate love! Who Doesn't Love A Busy Body Really! Upcoming Art To Be In The Know With!